This week I took a break from the river and my MA work to help clear my mind and decided to pursue one of my other photography passions. That of the great Somerset Illuminated Carnivals. 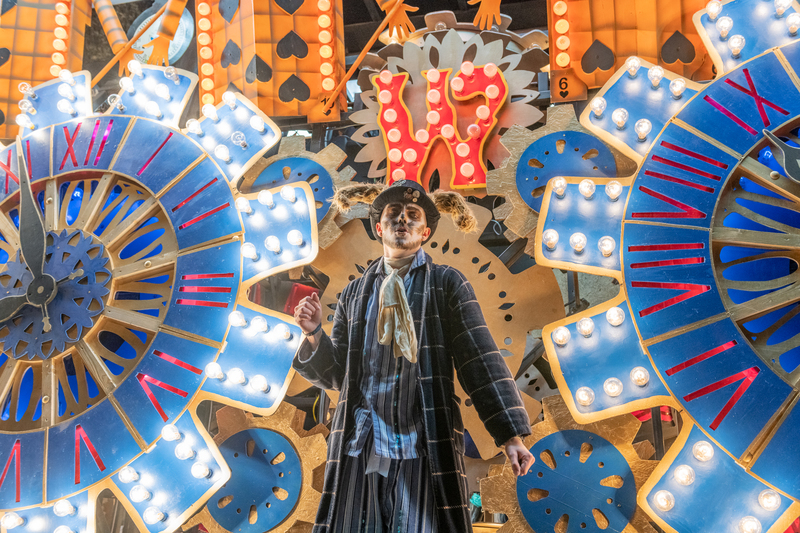 The Somerset Illuminated Carnivals are highly regarded as the largest illuminated procession in the world. They run at night during the autumn months and consist of illuminated carts that can be 100ft in length, 16ft high, and 11ft wide. Some carts have 20-40,000 light bulbs along with up to 30 or more performers onboard. Constructed year-round buy local carnival clubs across the Westcountry, the spectacle culminates in the great county circuit held every November. The event has been happening in Somerset for many hundreds of years, dating back to the 1600s with its embryonic stage linked to Bonfire night. Originating in Bridgewater the procession was re-developed in 1881 when lamps where used, moving to electric lights around 1913. Bridgwater is often seen as the home of carnival, with their annual squibbing event being one of the highlights of the season. Now, spread across the county of Somerset, the main events start in Bridgwater and end two weeks later in Glastonbury, with each procession attracting many tens of thousands of visitors. For me, Somerset Carnival time marks a spectacle not to be missed and also marks the move into winter. Between 2008 and 2011 I was lucky to have been able to work closely with some of the carnival teams, culminating in 2010 with an invitation to walk at the front of Glastonbury precession as part of my work with the emergency services. I will never forget the sight, as we rounded the corner at the top of the high street as thousands of people all tunned to face us and cheered at the same time. No camera could ever capture that level of emotion. My main passion for this event is photography. Its one of the most challenging live events I cover. Each cart is lit differently and is moving. Some have very rapidly moving internal parts, others are static based. Every cart has its own artistic style, which in turn requires its own adaptive photography to do the cart justice visually. For me, photographing carnival represents true subjective and objective field-based photography. You have to think on your feet and quickly, you have to be mindful of the cart as it passes and of any moving parts, as well of being mindful of how best to portray the performance on board. I started photographing carnival some years ago. Interestingly I was very surprised at the number of photographers who use flash to capture the carts. Use of flash and artificial light, for me, is a huge letdown. Months of work has gone into making these carts and to see flash being used to ‘illuminate’ them more is a travesty. One that I get very much on my soapbox about. Photographing carnival – in my view – is a fluid art form to be nurtured and worked on, like a potter works clay. Looking at the cart, the music used and the performers will tell you what sort of energy needs to be put into the image, how to frame and expose it and how to draw the viewer into, not just the image, but the cart itself. The carts move at walking pace – but with so many visitors the workspace is limited and so you really don’t get much time to shoot. When I was developing this work I discovered that the use of colour images give the full spectacle, but the use of black and white can often achieve surprising results. When I discussed this with one of the carnival organisers I was surprised at their reaction to my black and white images – they stated that they hadn’t considered this before and that the images moved to a different level. This is the colour image of one of my favourite angles. That being the cart coming down the road led by the support team. I often think these folk never get the exposure they deserve – indeed there is a whole project to be had on their work. Anyway, the colour image does give impact, spectacle and a sense of scale. But in my view no depth. You don’t get drawn into this image. Not perfect I know, but as an example, I feel this image has more depth and character. The black and white extenuate the shadows and details, while you lose the colour impact. I feel you gain more around the concept of scale and spectacle when these are linked to the colour plates of the cart itself. Granted it won’t work for all and often doesn’t. Image-wise, carnival is that spectacle that you can never get ‘just right’ and nor would I want it to. The day I take the perfect carnival image is the day I will stop going. It’s that excitement and drive to try and capture the event in the way it was meant to be seen that keeps me going. The hope that I can shoot an image as grand as the cart I am looking at is truly one of my great photography challenges.